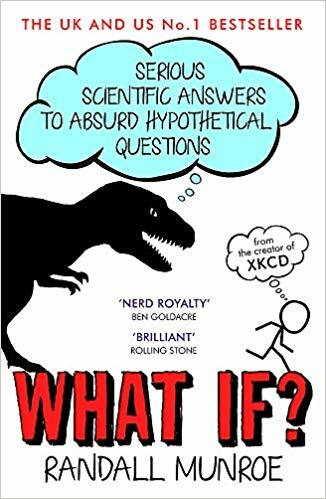 "Randall Munroe left NASA in 2005 to start up his hugely popular site XKCD 'a web comic of romance, sarcasm, math and language' which offers a witty take on the world of science and geeks. It now has 600,000 to a million page hits daily. Every now and then, Munroe would get emails asking him to arbitrate a science debate. 'My friend and I were arguing about what would happen if a bullet got struck by lightning, and we agreed that you should resolve it . . . ' He liked these questions so much that he started up What If. In pursuit of answers, Munroe runs computer simulations, pores over stacks of declassified military research memos, solves differential equations, and consults with nuclear reactor operators. His responses are masterpieces of clarity and hilarity, studded with memorable cartoons and infographics. They often predict the complete annihilation of humankind, or at least a really big explosion. Far more than a book for geeks, WHAT IF? : Serious Scientific Answers to Absurd Hypothetical Questions explains the laws of science in operation in a way that every intelligent reader will enjoy and feel much the smarter for having read." "They say there are no stupid questions. That’s obviously wrong; I think my question about hard and soft things, for example, is pretty stupid. But it turns out that trying to thoroughly answer a stupid question can take you to some pretty interesting places." A. Nearly everyone would die. Then things would get interesting." What If? 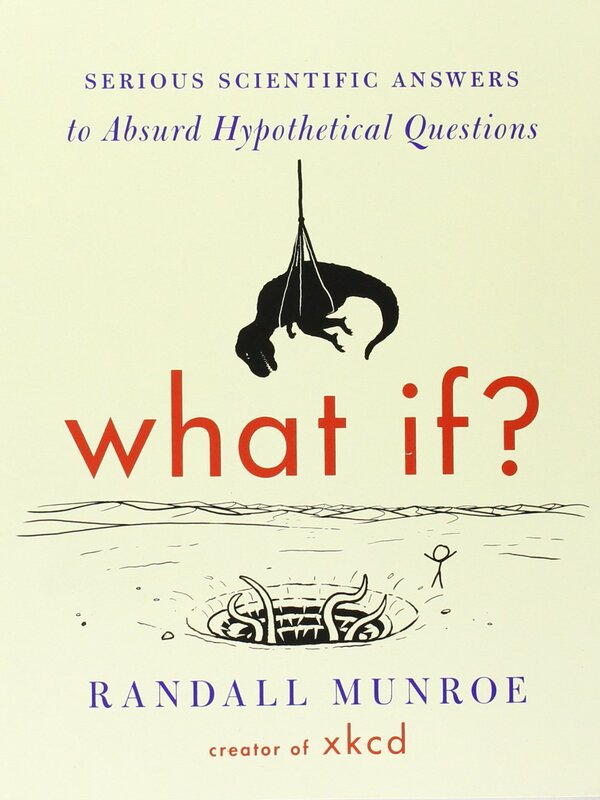 documents Randall Munroe's attempt to provide the best, most thorough and scientific answers to some really out-there questions. I really liked the overall concept of this book because I enjoy asking questions and learning new, nerdy things. I often wonder and ask "What if?" and "Why?" so seeing someone with a NASA background and scientific know-how able to answers questions ranging from sincere to bizarre was fun. That being said, the chapters themselves are rather hit-and-miss as far as interest level depending upon the question being answered. The book covers a wide range of questions, such as the velocity issue excerpted above, the danger of swimming in a radioactive swimming pool, if everyone on earth actually has a soulmate how the math and logistics would work out, to pointing a powerful laser at the moon. I liked Munroe's sarcastic and dry sense of humor as well as the stickman cartoons he inserts throughout the book to help audiences visualize the science behind his explanations. I did listen to the audiobook and have to admit my mind wandered in and out of focus depending upon the topic at hand. If I'd had a physical copy, I might have read through the questions and just read particular chapters of interest, but I still listened to them all and enjoyed Wil Wheatley's performance as narrator.